Board of Directors last week. die Shear, Herbert Swarzman, M.
$391,500 was allocated to UJA. received a total of $176,000). ment of a Palestinian state. scheduled to begin Dec. 7.
auto shop at the high school. ranks as an "economic parasite"
on Wednesday, Dec. 9, 7:30 p.m.
Arab Moderate Shot on W.
instantly by a fusillade of bullets. the headlights on their cars. Woman of the Year for 1981.
said that while he was "satisfied"
fore they were joined by Reagan. achieving peace in the Mideast. Fahd plan showed "some hope"
and Israel's right to exist. holy sites," the statement said. garlic bread and a plain omelet. fair, and a delicious culmination of coffee and elegant desserts. was a truly enjoyable and interesting evening. members of the camp committee. delightful day so keep it in mind and mark down February 1. Toronto this past June. The Gutha reside in the Carrollood area. Village Square East Shopping Center stop in and see them! y'aU are here in Tampa (I don't know how glad my diet i*. i A and overseas needs? in 1981 America, yet it does exist. (Normal rate on this room is $82.00). and the Best of Past Festivals. are available at the Tampa JCC. and the USF HUiei House. before the end of 1981.'" 1971 and settled in Jerusalem. day trip across the state. December 2, 23, 28, 30 10 a.m.-2 p.m.
1. Each camp session will meet from 10 a.m. 2 p.m.
per hour for this service and advance registration is required. something for everybody. Check the schedule and sign-up soon! Camp is limited to 30 children. Monday, December 219 a.m.-3 p.m.
Timbuktu Safari Day .spend the day at Busch Gardens' Dark Continent. Tuesday, December 2210 a.m.-2 p.m.
3. Please send a lunch with your child each day. A beverage B*8 Game Day ... at Castle Golf: boating, golf, and video. and a snack will be provided. own slide and tape show. Make popcorn for snacks, of course. Wednesday, December 23 9 a.m.-2 p.m.
Roller Skating. we'll be rollin' 'n' tumblin'. Monday, December 28 9 a.m.-3 p.m.
Ice Skating at Centre Ice and an afternoon of Bob-o and Bobbino. Wednesday, December 3010 a.m.-5 pan. Fantasy and Cruise Day at the Wax Museum and aboard Capt. Anderson. excluded from any activity due to a lack of financial resources. times and activities the bus will leave promptly after opening. gainistanya^aTstt^Clato^ex^rt Claim, proximstely caused by the gross negngenc. or willful misconduct of the JCC. Mastercharge or Visa Account No. BE ASSUMED BY THE JCC. Fairway Run Clubhouse. Members: S3., Nonmembers: $5. FAMILY KOSHER COOK IN: Led by Mimi Weiss. 12:30. JCC Kitchen. Center Family $2., Nonmemeber Family $5. COMMUNITY HANUKAH CELEBRATION: 5 p.m.
JCC Free. Come Light the Menorah, Sing and Celebrate. TWEEN MOVIES-SCIENCE FICTION DOUBLE FEATURE: 1 p.m.
7. 8 & 9th Graders Members Free, Other Members SI.. Nonmembers $2. Buck Rogers and Battle Beyond the Stars. Enjoy Your Winter Vacation at the Center and Have a Happy Hanukah!! under eight division, and Jeff Means and Jim McCotter in the under 12 age group. Point Elementary School. Contact Tim Stoker at 872-4451 for schedules. give us your fair share! terested in playing basketball, contact Danny Thro at 872-4451. Once again the JCC's Adult Basketball League looks like a winner. bers and non-members to enjoy. Film Festival on the 25th. this month's expanded version of the CENTERFOLD. Also look for the December JCC Notes. the most exciting and enjoyable fund raiser ever. suggestions or advice will please step foward. A lovely equipment brunch was held on November 4th at the JCC library. SON. NANCY VERKAUF. LYNN REIBER LAURA KREITZER. NANCY LINSKY. JUDY BAACH. ROCK MARCUS. two year old child, please take a minute to complete this questionairre. Your preferences will be helpful in making a determination. I am happy with the present offerings. three different times." "I'd like to take the course but..."
developed by you and Center staff not to succeed. Project Outreach programs have been cancelled. series program, please contact Darlene Wolfe at the JCC. pay a $2 fee for the lecture. December 20th at 12:30 p.m.
lesson, the families will eat their prepared food. at the JCC in the kitchen beginning 12:30 on December 20th. FORMS. 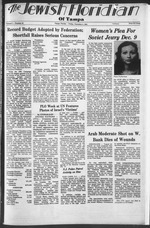 Look for the issue to appear in the January 1,1982 Floridian. Festival will again be a community celebration. Children under 12 and Seniors 60 and over). program at the Center. Details are in this Pullout. activities from 4 to 5 when the program begins. begins at 7:30p.m. at the JCC auditorium. "Children Should be Allowed to Discover Music For Themselves." Demaris Klafs. The piano accompanist for the Concerto competition is Ildiko Vadas. ARE BY LEVEL OF SKILL AT THIS TIME NOT BY AGE. 4:00 Scheduled Leeaon. Scheduled Laeeon. munity Services Program will offer adult classes at the Center. HCC for details and to request a brochure. the resources available to our members and local community. Please remember that the JCC will not be taking registration. office at HCC (879-7222). Ask him about "HCC at JCC." programs which are part of the expanding Center services. at HB. Plant High School. as from anv cast member. wind their way into your hearts. the charter to Dr. Steven Field, president of Congregation Kol Ami. beginning of the dedication ceremony. Rabbi Leonard Rosenthal display their charter. Open 11 to 2:30 Mon. thfjl.Frl. 550 miles east of Moscow. the stockpiling of arms in Israel. conflict in the Mideast break out. my with the Palestinian Arih.,,. Jerusalem. "The future of jJ? covered for the first year. For manon S9 and war. from the Sinai next Apr. 26. He bassy from Tel Aviv to Jenj. progressing very well in the last simple." Blakley. site manaaer, 872-4451. Menu subject to change. L;$ Friday Chicken with Gravy, Yellow Rice, Mixed Vegetables ? Jack Harman welcomes you to drhre the Mo. 1 sailing car In Israel. Corner Henderson Blvd. A Lots Ave.
them to the Jewish Agency for a ten-year period. committed to living in Israel." registered by the total 1980 campaign. be announced shortly after the end of the year. in four states and Puerto Rico. be particularly harmful to children. want to impose a set of moral values." programs have, especially on young people. on Saturday are allowed to participate fully. wrote recently to North Carolina Gov. James B. Permit us to see you as a friend. stated that "This shift in U.S.
country in the pursuit of peace." Don Stichter, Dr. Lawrence W.
which Lais mimed and danced. both Nixon capers is educational. AW ACS sale would go through." White House Chief of Staff H.R. majority of Americans have by. now had a bellyful of Mr. Nixon. start to rethink their view. with all other Americans. Mr.
was born on St. Patrick's Day." the laws be faithfully executed." Congregation Kol Ami Sisterhood Bowling 8 p.m.
p.m. B'nai B'rilh Women Open Board 8 p.m.
(evening chapter) General Membership Meeting 8 p.m.
National Council of Jewish Women General Meeting 9:45 a.m.
JCC 7:30 p.m. Hadassah-Brandon Meeting 7:30 p.m.
at Kay and Marie Jacobs. >: Wrapping at Wilsons-Fundraiser through Dec. 24. Serv ices: Friday. Bern. ; Saturday. 9 a.m.
Soturday Service 10:30 a.m. Monday Hebrew Chm 8 p.m. .
> Fund, said that the U .S. termed them "a big problem." to change." She said the U.S.
budget about $1 billion a year. In addition, she said, the U.S.
between the U.S. and Israel. and requests during the middle. is recited in the morning liturgy. color television and private cars. God ascending and descending on it" (Gen. 28.12). one greets the bride at a wedding. OrUlot, Nancy BUverman. all of Iaraal. ofTarael; hta paranU, Mr. and Mr..
with him and to give the land to him and his seed after him. ing 'house of God," and vowed to serve God there when . returned to his father's house. The Lord would be his God. agreement and not be involved. is what we pray for. AWACS, we will have no secrets. War is the tact that;? Heighta. down the lentrtk !? lives are in danger, we will do it. was left hanging in the air. iis created by the growls and. the UN partition border of 1947.
wars, as the best option. gathered at a startling rate. pert concern is Gen. "Arela"
radar screen and press a button. order to engage each other. the Saudi Navy in the Red Sea. This, today, is the fro. to cross minefields and obstacles. will be only a question of time. From a military point of view. whether Israel lives or dies. among any other group aboi"